Optical instruments based on polymer-dispersed liquid crystal (PDLC) have been used to inspect transparent electrodes. Generally the operating voltage of an inspection instrument using PDLC is very high, over 300 V, reducing its lifetime and reliability. The operating-voltage issue becomes more serious in the inspection of touch-screen panel (TSP) electrodes, due to the bezel structure protruding over the electrodes. We have theoretically calculated the parameters affecting the operating voltage as a function of the distance between the TSP and the PDLC, the thickness, and the dielectric constant of the sublayers when the inspection module was away from the TSP electrodes. We have experimentally verified the results, and have proposed a way to reduce the operating voltage by substituting a plastic substrate film with a hard coating layer of smaller thickness and higher dielectric constant. J. A. Pickering, “A highly area-efficient controller for capacitive touch screen panel systems,” Int. J. Man. Mach. Stud. 25, 249-269 (1986). T.-H. Hwang, W.-H. Cui, I.-S. Yang, and O.-K. Kwon, “A highly area-efficient controller for capacitive touch screen panel systems,” IEEE Trans. Cons. Elec. 56, 1115-1122 (2010). H.-K. Kim, S. Lee, and K.-S. Yun, “Capacitive tactile sensor array for touch screen application,” Sensor. Actuat. A: Phys. 165, 2-7, (2011). 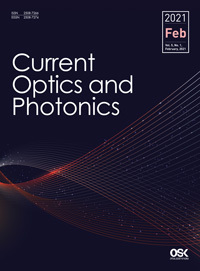 M. Koerdel, F. Alatas, A. Schick, K. Kragler, R. L. Weisfield, S. J. Rupitsch, and R. Lerch, IEEE, “Contactless inspection of flat-panel displays and detector panels by capacitive coupling,” Trans. Elec. Dev. 58, 3453-3462 (2011). J. L. West, “Phase-separation of liquid-crystals in polymers,” Mol. Cryst. Liq. Cryst. 157, 427-441 (1988). J. W. Doane, A. Golemme, J. L. West, J. B. Whitehead Jr., and B.-G. Wu, “Polymer dispersed liquid crystals for display application,” Mol. Cryst. Liq. Cryst. 165, 511-532 (1988). R. Ondris-Crawford, E. P. Boyko, B. G. Wagner, J. H. Erdmann, S. Zumer, and J. W. Doane, “Microscope textures of nematic droplets in polymer dispersed liquid crystals,” J. Appl. Phys. 69, 6380-6386 (1991). D. K. Yang, J. L. West, L. C. Chien, and J. W. Doane, “Control of reflectivity and bistability in displays using cholesteric liquid crystals,” J. Appl. Phys. 76, 1331-1333 (1994). M. J. Coles, C. Carboni, and H. J. Coles, “A highly bistable fast-shear aligned polymer dispersed ferroelectric liquid crystal device,” Liq. Cryst. 26, 679-684 (1999). P. J. Collings and J. S. Patel, Handbook of Liquid Crystal Research, (Oxford University Express, 1997) Chap. 9. X. Chen, “New-Generation electro-optic modulator for TFT array inspection,” SID Symposium Digest of Technical Papers, 1792-1795 (2005). C.-H. Chan, Y.-T. Zou, T.-K. Liu, C. H. Chen, H.-W. Wang, and S.-C. Lin, “The performance of an inspection system for indium tin oxide circuits by using a PDLC/ITO film,” Proc. of SPIE, 8916, 89161N1-89161N12 (2013). J.-H. Lee, T.-H. Yoon, and E-J. Choi, “Unusual temperature dependence of the splay elastic constant of a rodlike nematic liquid crystal doped with a highly kinked bent-core molecule,” Phys. Rev. E, 88, 062511 (2013). A. K. Srivastava, D.-Y. Kim, J. Kim, J. Jeong, J.-H. Lee, K.-U. Jeong, and V. Singh, “Dielectric relaxation in a novel tapered chiral photochromatic liquid crystalline dendrimer,” Liq. Cryst. 43, 920-927 (2016). S. O. Kasap, Principles of Electronic Materials and Devices, (McGraw Hill, 3rd Edition, 2006) Chap. 7. R. Yamaguchi and S. Sato, “Relationship between film thickness and electro-optical properties in polymer dispersed liquid crystal films,” Jpn. J. Appl. Phys. 33, 4007-4011 (1994). S.-H. Yoo, M.-K. Park, J.-S. Park, and H.-R. Kim, “Enhanced adhesion and transmittance uniformity in laminated polymer-dispersed liquid crystal films,” J. Opt. Soc. Kor. 18, 753-761 (2014). J. Heo, T.-H. Choi, J.-W. Huh, and T.-H. Yoon, “Negative liquid crystal cell with parallel patterned electrodes for high transmittance and fast switching,” J. Opt. Soc. Kor. 19, 260-264 (2015).